Santiago Ramón y Cajal (1852–1934) is the father of modern neuroscience. Most scientists of the time believed the brain was a continuous, interconnected network. Cajal argued that the brain was composed of individual cells: neurons. In the 1950’s, high-resolution electron microscopes proved him right. Why would someone like me, an illustrator, be interested in Señor Cajal? Because he was also a wonderful artist (he studied art before attending medical school). During his lifetime, he created more than 2900 drawings of the brain and other nerve tissue. Some of them are still used in textbooks. His work was the subject of a major exhibition last year. Here are some examples. Click on the composite below to see a larger version. On a personal note, I loved seeing the early “white-out” he used to correct his mistakes. Cajal taught himself photography and made carefully posed self-portraits throughout his life. Cajal used a microscope for his observations, and cross-hatching, dots, ink washes, and occasionally watercolor for his drawings. I write these posts to demonstrate the power and appeal of illustration to prospective clients– how does Cajal’s work fit into that? Working freehand, Cajal summarized what he saw under the microscope rather than making an exact copy. In a single sketch, he combined observations he made at different times, using different methods. He did this to illustrate a larger hypothesis, rather than just copying what he saw. In other words, he did what every good illustrator tries to do: to render a fuller reality or “truth”– one that a photograph can’t fully capture. Here’s an electron microscopy of the retina next to Cajal’s sketch. The photo is colorful, precise, literal, passive. 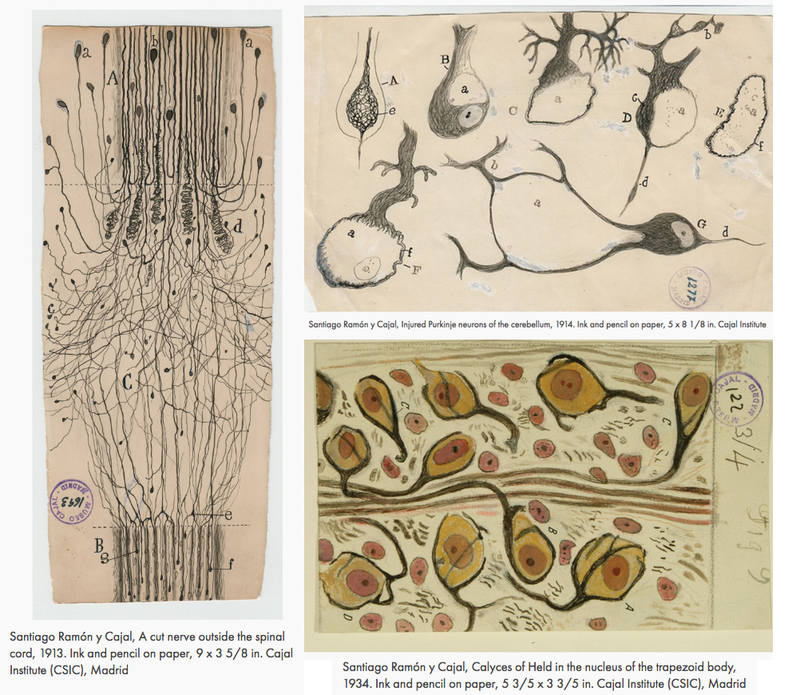 Cajal’s sketch has energy; it’s telling a story, emphasizing certain points, making connections. It’s trying to convey a truth that goes beyond a mere photographic record. your brand, and speaks your truth: what it is that makes you different: a brand worth choosing. I had enough of Twitter, for right now, and I have deactivated my account. I may return and stick to promoting the blogs that Julie and I do- and speaking of that, I reckon we need to start blogging more, again. Such a fascinating article. I didn’t know of Ramón y Cajal; I had some Latin American history in my schooling, but of course, the history of Spain was rather minimal. But, since I’ve had “street” and “book” education in the Spanish language, I should like to see his written notes sometime. I also find this fascinating as a subset of art and science. It’s something my divergent-analytical mind can really appreciate, because I haven’t done well in more sequential-analytical fields, like computer science, software engineering, and mathematics, although I find their concepts engaging. I’m still working with scalable vector graphics, making Sanity Signs in the U.S. road sign style. I will remember to stay better in touch and keep reading your blog, as I especially appreciate the the artist tips. It’s still a dream of mine that my family of four might be able to work as a graphics and animation studio someday, but, we’ll see. Always a pleasure, sir. Hope to hear from you soon. Just as a skilled painter can render scenes that are “truer than life,” so Cajal brought out neural realities that photographs don’t fully capture. How do such artists work their magic? Somehow, they bring the meaningful features of their subject into sharp relief. It takes a human to see like a human. You’re right: it’s a fascinating intersection of art and science, and I think it teaches that art isn’t something apart from life, but rather a means of achieving a deeper understanding of life, in all its complexity and many facets.